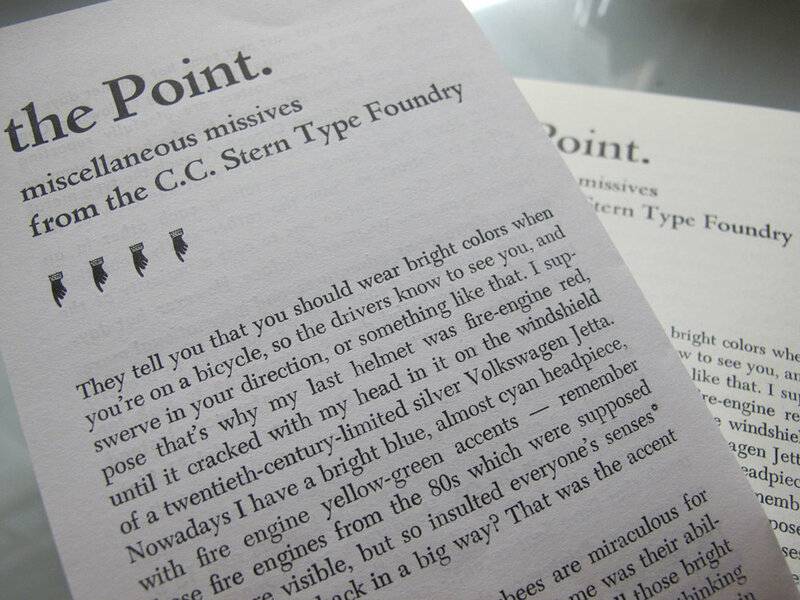 Another print run of “The Point.” The Point is a newsletter from the C.C. Stern Type Foundry. With “miscellaneous missives” penned by foundry volunteers. Composition was originally cast at the 11th hour before leaving for the 2018 American Type Casting Fellowship Conference. Types used: Linotype 10pt Caledonia 496 with Metro Medium and italic 462. Heading is set in Jensen Bold and cast on the Ludlow. There’s a sampling of DeVinne Monotype No. 11 cast on the Monotype sorts caster. Also miscellaneous Lino and Monotype decorative material.